I got to hear about rhino poaching at INDABA 2013, much before we reached the bushes. 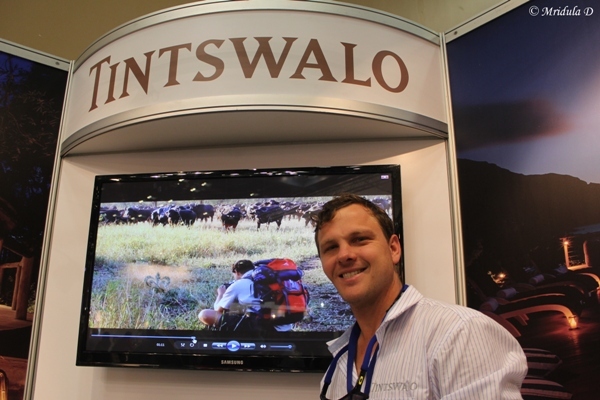 While walking around the INDABA 2013 stalls I spotted Tintswalo Lodges and I dropped in to say hello as I knew we were doing safaris with them later. Later that day two of our group members told me that there were people from Tintswalo who were attempting to walk 1000 kms to raise awareness and funding for Rhino conservation. They call the initiative TREC 1000. We heard the voices of concern all around INDABA 2013 with various game reserves pitching in their efforts and concerns. You can follow the progress of the walk from their TREC1000 Facebook page as well. Lately all doesn’t seem to be going according to the plan out there, I hope the luck changes for the group soon. We met Fritz Breytenbach at INDABA 2013 and he talked passionately about his walk. His camera had already been knocked out by an elephant once. 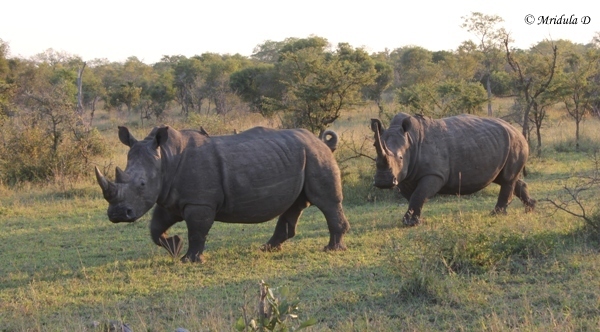 We also talked to people from South African National Parks and one of the officials said about the situation, “We are bleeding … it is a war we cannot afford to lose.” Apparently 2 rhinos (all spices) are poached daily in South Africa alone, a majority from Kruger National Park. A rumor that powered rhino horn can cure cancer has wrecked havoc on the rhinos in the recent time in South Africa and elsewhere in the world. The park rangers also felt that they were trained in maintaining the park and not fighting an armed war with the poachers. So South Africa has enlisted the services of retired military officer Johan Jooste to coordinate the anti poaching efforts. We had this really close encounter with white rhinos on our first ride with the Tintswalo Lodges and it was such a fascinating experience. To think that these animals are indiscriminately killed is a huge reflection on the human nature. I was told that the commercial angle was just too much to resist. Apparently one rhino itself is worth a few million South African Rand. Having a long border with Mozambique without a fence is also considered to be part of the problem as poachers get away to that part after poaching. The issue of protecting rhinos in South Africa is a complicated one with no easy solutions in sight, however it was heartening to see so many people acknowledge it, talking about it and doing their bit.